Late last year, we installed 8 Solar PV panels on our house totaling 2.2kW of generation capacity. Since then, we have happily watched our house drop off the grid when the sun comes up – the entire house powered by Solar PV. 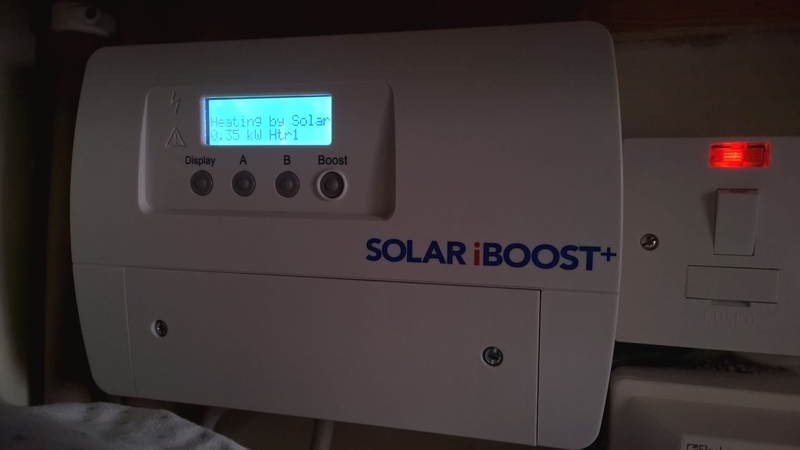 At the same time, we also installed an iBoost hot water diversion unit which puts excess Solar generation (when the Solar panels are producing more energy than the house is consuming) into the hot water tank by heating water. As a rough summary, it looks like it will cut our electricity bill by 50% (remember, this includes fueling our car) and our hot water bill by 80%. That is pretty impressive for the effort of a few panels on otherwise unused roof space. The whole installation cost €4313. In the first six month of operation, it generated 1,145kWh (1.145MWh). Between the electricity and hot water savings, it will save us €351.25 in the first year, and more each year as grid energy costs increase. All up, the investment in PV is delivering a risk-free ROI of 6.2% – making it a better investment than paying down our mortgage (3.05%). It is also making us very happy! Thankfully (as we are in Ireland), they don’t need direct sunshine to work. They also generate in cloudy weather, at about 60% capacity. Even on the most miserably rainy days, they’ve powered the baseline consumption of the house for a few hours either side of midday. The installation is pretty straight forward. It took about 3 hours from start to finish. Brackets are fitted under the tiles, to which bars slide through, and then the panels are secured to those bars. Nothing is screwed or nailed through the roof, so the waterproof membrane is never touched. The panels are wired together and that wire is fed under the eve of the roof, again to ensure no risk of introducing a leak, into the inverter. The inverter is a box which converts the Direct Current that the panels generate, to Alternating Current, which electricity grids and all of our appliances run off of. The inverter watches the grid and “injects” the solar-generated electricity in at the same frequency and voltage. iBoost Hot Water Diversion Unit. It puts excess Solar generation (when the Solar panels are producing more energy than the house is consuming) into the hot water tank by heating water. A cloudless day as seen by Solar PV panels – you can see as the sun moves overhead during the day, and maxes out the generation. 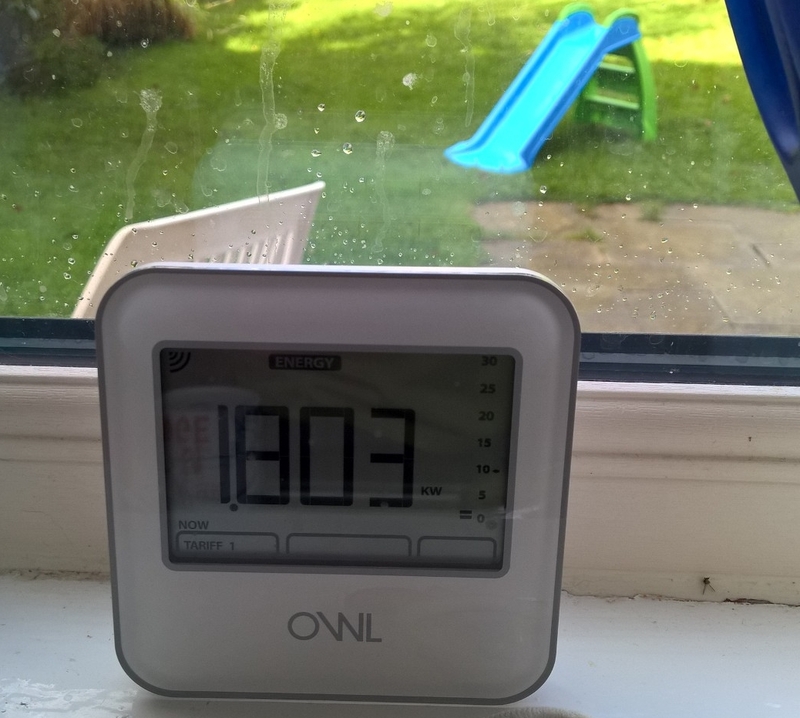 There is a slight drawback to the OWL Intuition PV monitoring system, which is that it doesn’t properly support the setup we have where the inverter is in the attic, and the meter is downstairs – it doesn’t support two transmitters, so we only have the PV generation in real time via the web portal. We don’t see the data for the houses’ net consumption. I’m working on finding a monitoring system that works with our setup. Obviously, this doesn’t impact what the system is generating, it just means I need to look at the iBoost to see whether the PV is generating more than the house is consuming or vice versa. Follow up post to come on this when a working import/export monitoring system martializes. In simple terms: solar panels cost money to buy and install, and they pay for themselves by generating electricity which reduces (or removes entirely) the amount of electricity and gas we need to buy from our utility. For us, it will take 8-11 years for the panels to pay for themselves, and they are warrantied for 25 years, so for the following 14 – 17 years after they have paid for themselves, they will sit there producing “free” electricity. That results in an investment ROI of 240%, or a yearly ROI of 240%/25 years = 9.6%. Over it’s lifetime, it will generate electricity at €0.07 per kWh, versus the grid cost of €0.19 per kWh. We used to consume (and pay for) electricity from the grid. Now some of the energy we need comes straight from the panels. As an example comparing April 2016 (before we had PV) with April 2017 (after we installed PV): in April 2016, we consumed 229kWh during the day. 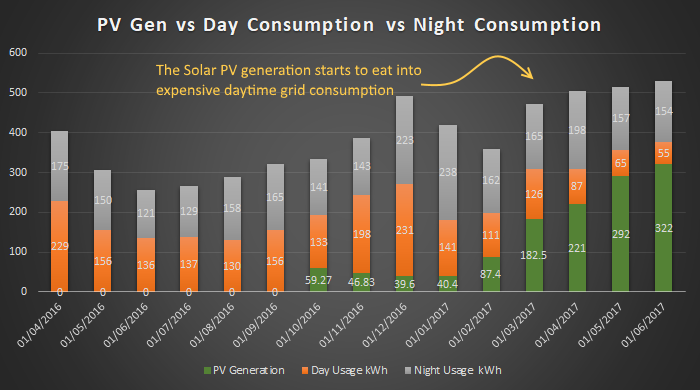 In 2017, we consumed 87kWh. 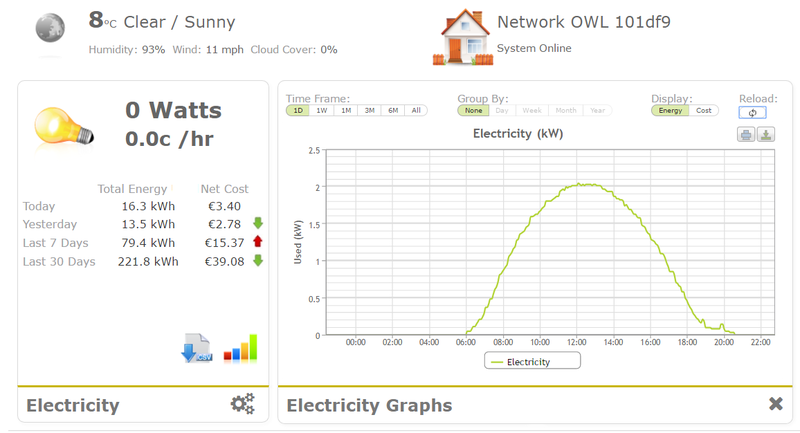 So the PV resulted in a reduction of 229 – 87 = 142 kWh. At €0.19, that’s a saving of 142 * €0.19 = €26.98 for the month. Averaged over the first 6 months of 2017, including electricity and hot water savings, the system saved a total of €175.62, an average of €29.27 per month, or €351.24 per year. Solar generation is eating into our bills. The orange box being squeezed is great news – that’s the expensive day time electricity (€0.19 / kWh) being eaten up by the Solar PV generation (€0.00 / kWh). An interesting calculation is the cost per kWh of the entire system. It will generate about 2290kWh per year for the next 25 years. That’s 2290* 25 = 57250 kWh. 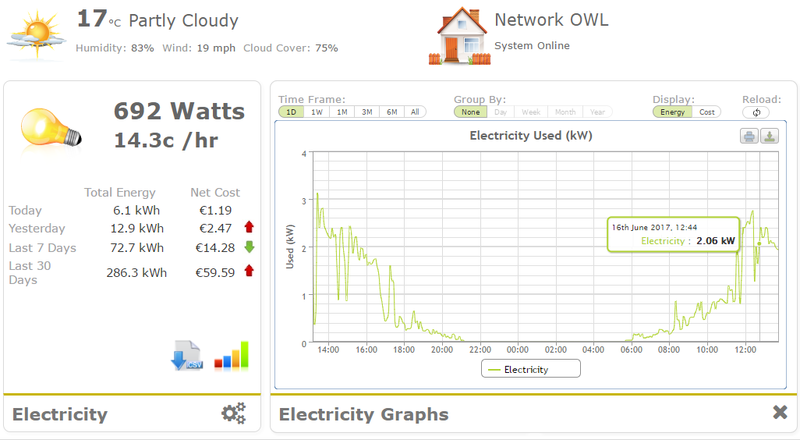 It cost €4,313 to install, which gives 4313 / 57250 = €0.07 per kWh versus the grid price of €0.19 per kWh. PV actually generated 221kWh during April. We consumed 142kWh as electricity, and the excess, 117kWh was used for hot water. 117 kWh / 30 days = about 3.9kWh a day. That hot water is used primarily for showers, which removes the need to use the electric shower. For a ballpark figure, heating 100 litres of water from 20C to 50C consumes 3.5kWh. This would allow for about 4 showers. We have on average three showers a day, split about evenly between day and night rate, so we’ll take the average day / night rate electricity at 19 + 7 = 26 / 2 = €0.13 / kWh. An 8 minute shower in a 7.5kWh electric shower consumes about 1kWh, so that’s a hot water saving of 3 * €0.13 = €0.39 per day, or €0.39 * 30 = €11.70 per month. The panels will generate about 2100kWh per year for the next 25 years. Ireland’s electricity grid emits 535 grams of CO2 per kWh. That means the panels offset 2100 * .535 = 1123.5 kg CO2 per year, or 1123.5 * 25 = 28,087.5 kg CO2 over their lifetime. Twenty eight tonnes! I actually believe the figure is even better, because electricity demand is higher during the day in Ireland, and so more expensive, higher emitting power plants come online to meet the need. Solar generates during the day, so the power the panels generates reduces the amount of generation required from the dirtier plants. The UK recently went a whole day without a coal plant contributing to their grid for the first time since the 1880s for exactly this reason – because they have installed a decent amount of solar. Paying down the mortgage: €4313 compounded at 3.05% (our mortgage interest rate) for 24 years turns into €8,870.16 of net wealth at year 25. So for these two relatively risk free investment choices, putting the money into Solar PV is a clear winner for me. 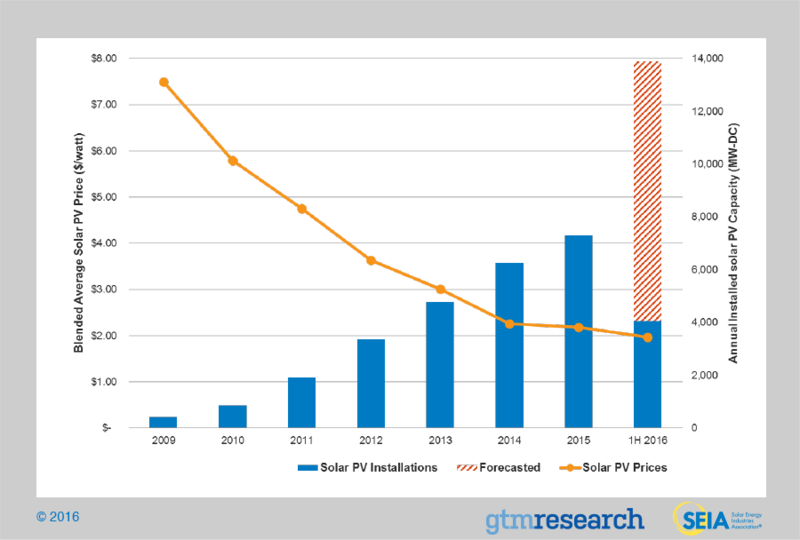 I see now why Solar PV will change everything. With an ROI of 6.2% in Ireland and the cost of Solar PV installations falling every month, it seems to be on an unstoppable path to everyone installing it – it’s simply cheaper than buying the same power from the grid. The quality of life and happiness impact of installing solar has been significant. Even though the ROI of installing insulation is higher, PV feels much more present in our everyday life. Cooking lunch and a coffee (as well as everything else – dishwasher, washing machine, charging the car) on weekends completely powered by solar electricity is absolutely fantastic. Attaching a hose to the kitchen tap and filling the kid’s paddling pool with solar heated water was another highlight. When we switched to an electric car, we had our first taste of getting away from fossil fuels and their associated drain on our family’s finances. If anything, this has been an even bigger step. We can literally fuel our car for free, we can enjoy energy consumption during the day at no cost, and we are insulated against increases in the price of electricity and gas in the future. Our next step will likely be to either install a Heat Pump, or a battery to store excess PV generation – more research to follow. 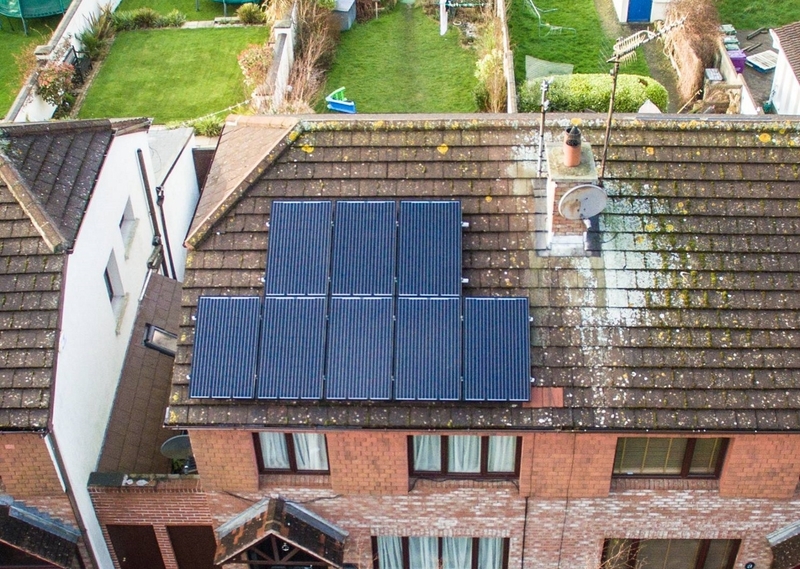 But for now, the bottom line is that PV has lived up to its expectation of a better investment than any other low risk investment, delivering a 6.2% ROI, insulation from energy price shocks, saving €350 and 1,123kg of CO2 per year. What's the cheapest way to heat and cool a house? Another great post Conor, thanks so much! Keep it up.